Take an evidence based initiative to find out the underlying strengths of your best people to then seek these strengths in future hires. Have you ever looked at a particular employee and thought “if we had more of this person we would be more successful”? High-performance modelling is an organisational tool that allows you to do just that. So how does it work? You identify the members of your organisation who perform well and whom you are proud to employ. Once you have found these high performers, we determine their “real world outcomes” – the practical outcomes that can be used to measure their job performance. High-performance models can apply broadly, for instance to an entire organisation, or they can be very specific, for example by looking at the characteristics that your best sales representatives share. Using SACS psychometric testing, we identify the psychological characteristics that these employees have in common. We typically assess them for cognitive ability, personality and values. Once we have done this we statistically assess the results and identify the characteristics that are shared by 80% or more of these exemplars. This provides you with psychological profiles that can give you the confidence that you are recruiting core characteristics possessed by these outstanding employees. SACS conducts competency interviews with the exemplars to find out what skills, knowledge, values and attitudes they have in common. A strong psychological profile is extremely helpful, but it is not enough to make somebody an exceptional performer. Exceptional performers also have skills, experience, attitudes, and a style that equips them to do their job very well. We analyse the outcomes of the competency interviews to identify the characteristics that are shared by at least 80% of the exemplars. SACS creates a high performance model. When we have assembled all of the data, we create a high performance model document for you. Using the outcomes of the psychometric assessments and competency interviews, we create behavioural questions and a simple psychometric scoring system to help you find new employees that share characteristics with your high performers. This will include a psychological profile, characteristics you should be looking for in resumes, behavioural interview questions, and appropriate answers that you may be seeking from the behavioural interviewing process. SACS provides you with a High Performance Model Psych Report. Upon completion of the High Performance Modelling Evaluation, SACS will prepare a tailored report based on the Psychological Profile of your best staff. This report will be available through the SACS Psychometric Assessment Portal; you will be able to generate candidate reports which include a high performance evaluation – a simple tabulated indication of where the candidate does and does not match the proven characteristics of your high performers and an overall Yes or No in terms of whether you should proceed to hire or not. 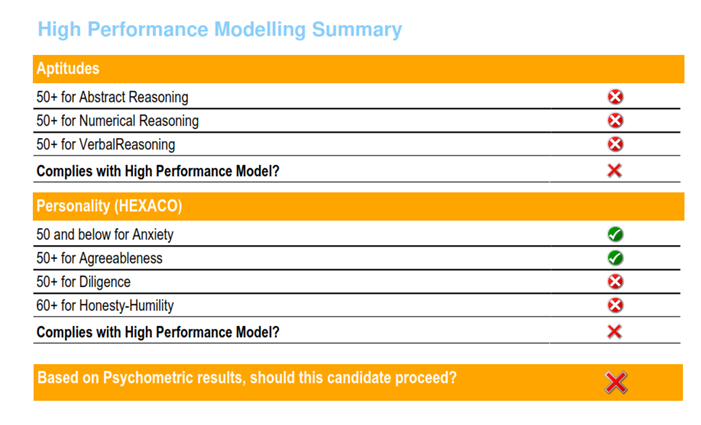 The report will be available for each candidate you assess against your high performance model. You pick your best people, and we find out what characteristics they have in common. No more guessing.